Prosperity continued as more rail links were made through Providence in the 1840s and 1850s. Roads were improved and created, as were bridges and canals. Gas lighting was established in 1847, making the city a thoroughly modern place. The public school system established earlier in the century continued to expand and improve, and Providence became known as an educational as well as an industrial center. In the last half of the nineteenth century, immigrants poured into Providence looking for work and opportunity. By the end of the 1800s Providence was home to some of the worlds largest factories (tools, files, screws, engines, and silverware). The names of Providence companies like Brown and Sharpe, American Screw, Corliss Steam Engine, Nicholson File, and Gorham Silver were known the world over. With immigrant workers, necessary to keep these huge plants operating, came organized labor. The Knights of Labor first came to Providence in 1882, and other unions followed, many specific to certain trades. In the 1870s, 80s, and 90s, immigrants continued to flood into Providence, swelling its population to 175,597 by 1900up from 54,595 in 1865. More than sixty percent of Providences residents were foreign born at the end of the 19th century. Newer immigrants included Portuguese, Italians, Poles, Cape Verdeans, and British. Religious diversity got a boost with Jewish immigration. As the workforce grew, not surprisingly so did the labor movement. Unions began to be established in the 1880s. 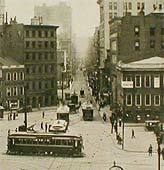 Truly a Golden Age, the last decades of the nineteenth century brought unparalleled wealth to Providence. Civic improvements followed with expanded services and facilities, including new public parks and recreation facilities. Private efforts financed the building of an opera house, an auditorium, a grand hotel, and a new railroad terminal, among other urban improvements. Higher education benefited from the establishment of a womens college, Pembroke, within Brown University; the founding of the Rhode Island School of Design; and the re-opening of the State Normal School. At the beginning of the twentieth century, when the Tirocchis immigrated, Providence was one of the most prosperous cities in the country. It led the U. S. in jewelry and woolen textile production, and was third in machinery and precision toolsboth critical for the industrial age. By 1910, almost 225,000 people lived in Providence, far more than inhabited the city in the year 2000. Almost every sector of the economy grew, and business buildings and private homes were built to meet the demand of the increasing population. Telephones, electricity, and automobiles, all present in Providence by the late nineteenth century, swelled in importance in the early twentieth. As the cost of these modern devices and services came down, availability went up. By 1919, there were over 60,000 telephone customers in Providence. Public works, such as an improved sewer system, better streets, and harbor improvements served also to improve the business climate. However, Providences manufacturing sector was already in trouble. Its plants were aging and its labor force was expensive compared to non-union labor in the competing Southern factories. Cheaper transportation systems and lower taxes in the South also put pressure on Northern industries. Even before the Great Depression began in 1929, Providence was beginning to reel from increased unemployment and a stressed economy. In 1920 almost half of Rhode Islands workers worked in the textile mills. A decade later, one-quarter of them had lost their jobs. By 1938, the total number of textile workers had dropped to 12,000, from a high of 34,000 in 1923. Citywide, the Depression hit hard. All industrial sectors, trades, retail, and white-collar jobs were affected. Public work relief, instituted by the City of Providence with assistance from state and federal loans, provided work throughout the 1930s to desperate citizens. Among the projects were new road construction, new schools and public buildings, and park improvements. Without these, and the federal governments Works Progress Administration (WPA) projects, Providences out-of-work citizenry would have been in even more dire circumstances. It was a hard decade for the city and the Tirocchi shop suffered along with the rest of the local economy. For the story of the Tirocchi family's move from Italy to Providence, see the immigration pages.